Mesh Back Revolving Chair has T Looking arms. The T Arms with elegant Mesh Net Back gives the chair a very elegant look. The Chair is very beautiful to place in any area of your office or home. 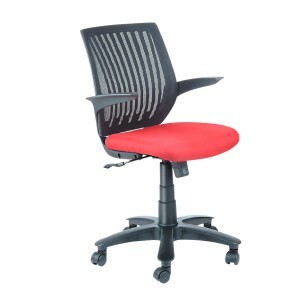 The Chair is fitted with Syncro Push Back Mechanism, Hydraulic Gas Lift, Nylon Base with Nylon Twin Castors. The Chair is very good in general seating area, staff chair of visitor chair.